As promised in the previous "dino project" listing ("Triceratops, Duckbills, and Champsosaurs...Oh My!! "), this project is the second - laboratory - phase of the Custer-Gallatin NF field session. So, dust off you field clothes, and follow (or join) Forest Service Paleontologist Barb Beasley and the Paleontology Preparators at the South Dakota School and Mines & Technology (SDSM&T), to learn how to free fossils from their sedimentary matrices, and get them ready to be catalogued and curated. 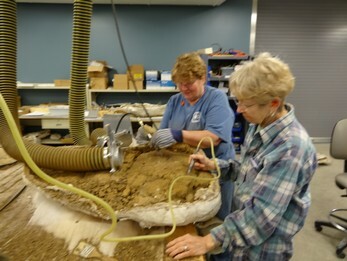 Volunteers will learn to use a wide variety of tools, consolidants, and other methods to stabilize fossils for long-term storage. During this project's "off hours," volunteers can visit the Museum of Geology on campus or the numerous historical, shopping, eating, and other attractions in Rapid City and the surrounding Black Hills. We look forward to seeing you (or seeing you again) this summer!